Each bottle was available for purchase, to be opened and consumed at the gala with the meal. Prices ranged from $40 to $200 per bottle. Welcome to wine week! Every post this week ties to alcohol. Here’s the post explaining why. A few benefit auctions I conduct each year aren’t known as wine auctions, but they have such a stellar collection of wine available that the lots could easily be sold in a wine auction and fit right in. This Los Angeles, CA gala is one such event. In fact, the ~300 guests aren’t just treated to great wine lots in the auction, but they get to enjoy exquisite wines in several ways throughout the evening. Here’s how. Offering complementary glasses of high-end wine during the silent auction. It was explained to me that one donor walked in with $40,000 worth of wine to pour for guests during the reception. I haven’t researched the wines to know whether that number is accurate, but I wouldn’t be surprised if it was. “Is there a specific reason he’s doing that?” I asked the planner. The “Fine Wine Tasting” was less about getting a one-ounce sip of wine and more about a full-on pour. The two photos show the handout that guests were given. 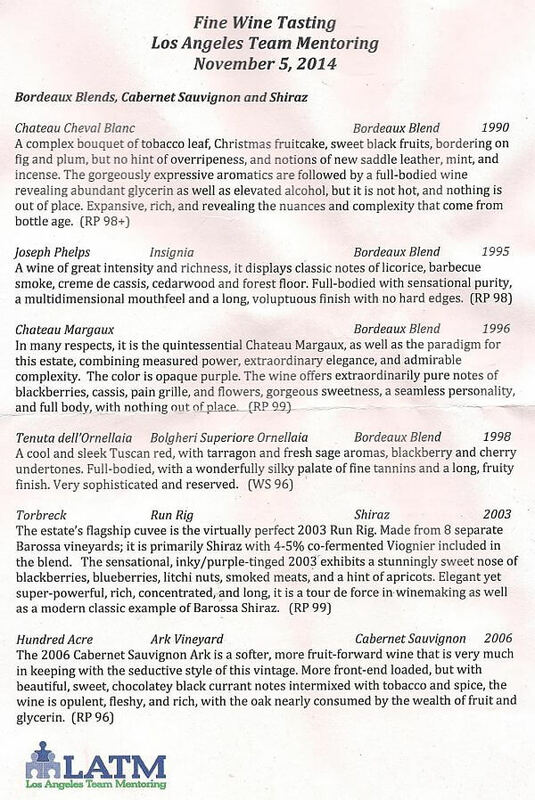 You can see how they described the wines. Here’s a quick list of what was served. Wine bottles were sold during the reception to be enjoyed with the meal. For any guest who wanted to upgrade his dinner, he could buy a $40 to $200 bottle of wine to enjoy with his meal. A variety of red and white wine was available for purchase during the silent auction. A tag around the neck of the bottle indicated the price for that wine. Once purchased, the bottle was transferred to the appropriate buyer’s table to be opened and consumed during the meal. 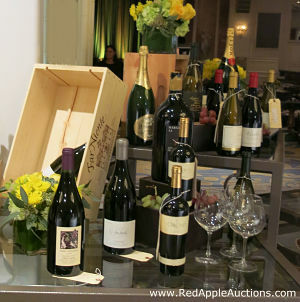 Two of the eight live auction lots featured wine. Eight items were offered in the live auction. 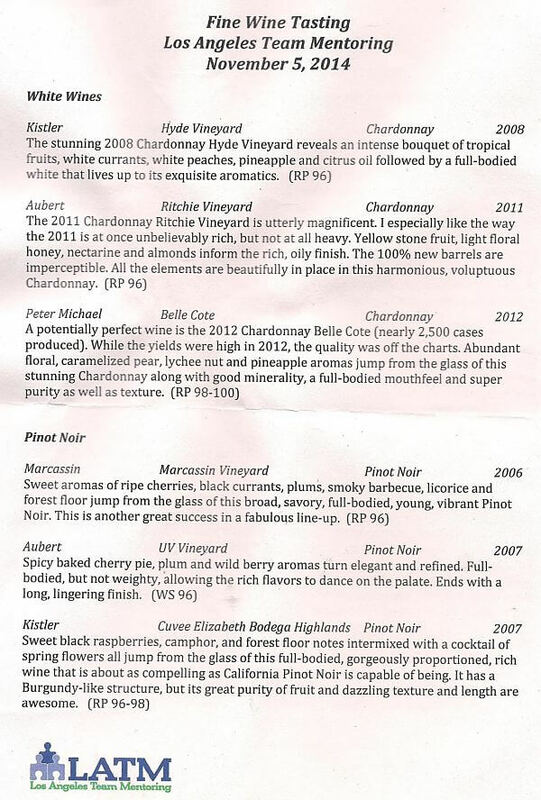 Two of the eight lots were wine-related, and they ended up being the two highest selling lots. The collection included 70 bottles of wine, including two magnums. The value of the lot was $8000; it sold for $9500. One donor has an impressive wine cellar in his Bel Air home. (I believe his cellar held over 2500 bottles of wine.) The package was a 5-course wine paired gourmet dinner in his cellar. Though the specific wines to be served were not known, I explained that the bidder and his friends would be consuming several thousands of dollars worth of wine that night. The pairings would be personally selected by the donor. The lot sold for $25,000. This gala was one I featured in-depth during a past Auction Insiders monthly webinar. If you’d like to get a regular dose of fresh ideas to learn how top events around the country are differentiating their galas, you can join dozens of other auction planners in my affordable monthly auction coaching program. Click to learn about Auction Insiders.